In late 2011, Pohnpei Public Library launched its very own Adopt-a-Magazine Program. The worldwide economic crisis has affected libraries all over the world, shrinking their funding and forcing them to improvise to stay afloat. Even some of the largest and most well-funded libraries have found it difficult to maintain their periodical collections, which require significant allocations to cover annual subscription renewals. Adopt-a-Magazine programs were developed to give the community a chance to help out. Pohnpei Public Library has never really had a budget for periodical subscriptions (the only magazines that we used to have were random issues donated by patrons). That all changed in early 2012, when people from both inside and outside Pohnpei's community responded with great enthusiasm to our new drive by adopting 35 magazine subscriptions! We now have an incredible periodical section that we think would stand up even to some of the largest libraries in the region. We would like to keep it that way and continue to provide the community with the best of the best. Pohnpei Public Library's Adopt-a-Magazine Program allows individual members of Pohnpei's community, local businesses, non-profits, NGOs, embassies, government agencies, and outside donors to directly support our magazine collection. 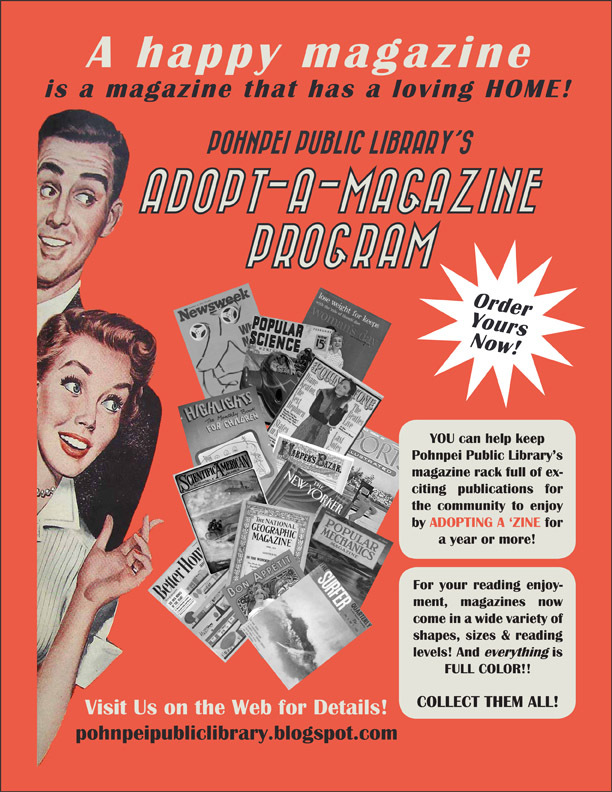 When you choose to ‘adopt' a magazine, you select a title and support it financially for a minimum period of 1 year by paying its subscription cost ($10 to $70), thus helping to maintain a diverse selection of periodical reading material for all of the library patrons. Browse our magazine adoption list for a magazine you would like to adopt, check the expiration date in orange, and click the BUY button below the magazine description to proceed to the Amazon Wish-List. Find the title on the list and click Add to Cart. Orders require a credit card or a debit card with a VISA logo. For subscriptions that are still active, Amazon will process a renewal. The library address will automatically come up when you get to the shipping step of the process. After making your purchase, CLICK HERE and fill out and submit the Magazine Adoption Form for our records. You can also pick up a paper form at the library or email pohnpeipubliclibrary@gmail.com to have one sent digitally. Forward us any order confirmation or the receipt email you receive after making your purchase. The receipt information is helpful if there are issues with the subscription and we need to contact the magazine's customer service department. Write you a donation receipt so that you can get a tax deduction, if you want one, and send you an appreciation certificate. List you on the Contributors' page of the blog as the "foster parent" of the magazine (unless you would like to remain anonymous). Make sure that anyone who comes to the library has free access to all of the issues of the magazine you adopted and a nice, comfortable chair in which to read them.